I'm sure everyone has heard about bubble tea at least once. 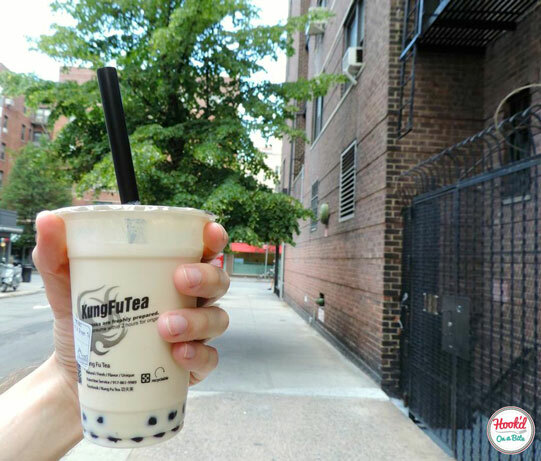 Since this new concept of tea has been introduced to New Yorkers, it has become a craze, prompting many places in the city to sell it, but you won't find it anywhere as delicious as Kung Fu Tea. For those who still don't quite know what bubble tea is - don't be afraid! It's nothing too crazy. Bubble tea is made with the same kind of tea that you would find at any other cafe. The only difference is that instead of being mixed with water, it's mixed with milk, juice, or tapioca - a starch extracted from a plant native to Brasil. First, you choose your tea flavor, then ask for some bubbles (aka tapioca), and your delicious creation is ready! 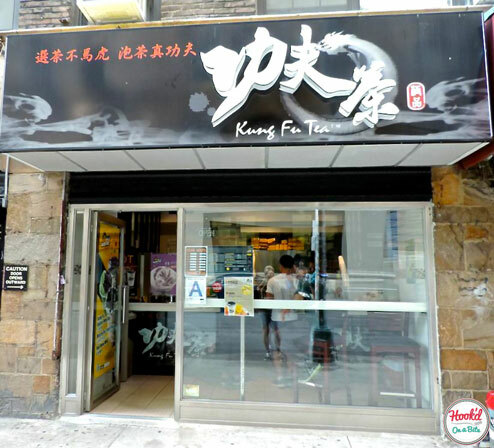 Kung Fu Tea is "the unchallenged expert in the bubble tea business", and they don't only offer the generic flavors. You can find unique selections here such as Passionfruit Green Tea, Caramel Macchiato Slush, and many more. 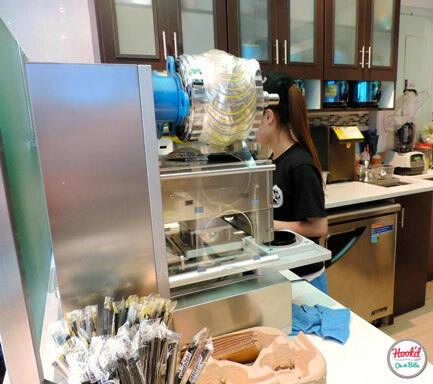 Another factor that sets them apart is that instead of hand shaking the tea, a machine rapidly spins your flavors, giving your beverage a smoother and more silky mouth feel. I also love that you can choose your sugar content, ensuring it isn't too sweet! When I first visited Kung Fu Tea, I was quite overwhelmed by all these flavors. Notoriously known as the king of indecisiveness, I could not make up my mind easily, but then chose my all time favorite: Green Tea - I recommend it strongly along with passion fruit! You might ask "why this place is so popular and successful? It's just a bubble tea." Well, I say: try it for yourself! You may just Get Hook'd! Usually when you eat in a Mexican restaurant outside of the West Coast, you expect large portions of rich refried beans, heaps of rice, and canned mole over soggy enchiladas. At Gran Electrica, you won’t find anything like this (thank god!). With the owners’ emphasis on locally sourced and sustainable ingredients, you can taste the unique difference in their food. Served in tastefully smaller portions, one is really able to appreciate the carefully chosen quality ingredients and flavors in the food. Not to mention, GE has a mother-daughter tortilla-making duo who hand presses each tortilla to perfection every day. It may seem like a small detail, but a good quality, fresh tortilla makes worlds of a difference. Another quirky part of Gran Electrica that may catch your eye is the wallpaper. Inspired by the famous Mexican artist Jose Guadalupe Posada, the interior walls embody the vibrancy of Mexican art by adhering to a Day of the Dead theme. The print depicts skeletons prancing about iconic DUMBO attractions such as Jane’s Carousel and the Manhattan Bridge, providing a lovely fun image of the local neighborhood. The idea behind Gran Electrica is to source the best and most sustainable ingredients available in order to provide a unique spin on traditional Mexican foods from all over the country; especially beach and street cuisine. The current chef at Gran Electrica, Rolando, is a native Mexican bringing authentic inspiration to the restaurant’s menu. The chefs at both of Tamer Hamawi, Elise Rosenberg, and Emelie Kihlstrom’s restaurants also have strong relationships with their farmers in order to guarantee a “table to farm” system, rather than “farm to table”. This method insures that they get all the ingredients they need at the highest quality possible, while also being sustainably grown. Gran Electrica is DUMBO’s mexican jewel and definitely worth checking out. Be sure to take advantage of their beautiful outdoor space, great for events and equipped with a full bar great for a refreshing grapefruit margarita on a hot summer night! My friend and I woke up late one day, and were craving some not-so-typical brunch. I searched for the most affordable but unique place, and came across Feast! They sell a (quite genius) Prix-Fixe brunch option. For only $26, you can choose from a selection of alcoholic and non-alcoholic drinks, nibble on the "shares", and finally choose one brunch plate from the menu. When our server told us about the "shares" of that day, I was expecting some little croissants and maybe a danish or two. However, I was extremely happy to be wrong! 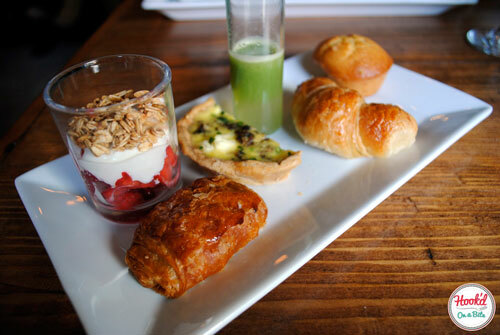 The back-waiter brought us a plate of: 2 fresh mini croissants (both chocolate and regular), corn muffins, strawberry - pomegranate yogurt parfaits, shots of the juice of the day - cucumber apple, and finally the star of the show, a mushroom, feta cheese and chive quiche. I savored each one as slowly as I could and didn't ever want it to end... I love the way Chef Christopher Meenan gives you a little taste of everything, but still leaves just enough room to keep you hungry for your plate that's on its way. I was also pleased to find that these shares are always changing...so you'll never be bored! I decided on the lemon soufflé pancake with mascarpone, apple butter, and poached pear, while my friend chose the "wild mushrooms" egg and puff pastry dish. When you bite into the pancake, you can feel the fluffy soufflé style egg on your tongue, with some sweetness from the apple butter and mascarpone quickly catching up. The poached pear had a unique flavor: sweet, yet complex - one that flawlessly complemented the delicious twang of lemon zest you would get every few bites. The scrambled eggs on the "wild mushrooms" made our mouths water as soon as they came out to our table. They literally glistened in the light and made chives look better than I've ever seen them. I also enjoyed the little kick of red bell pepper on top to cut through that earthy mushroom taste.